Cardea SOLO™’s proprietary algorithms are engineered to accurately detect transient, difficult-to-diagnose or asymptomatic arrhythmias. Integrating seamlessly into your clinical practice, the Cardea SOLO™ system supports a consistent continuum of care from application through diagnostic analysis and treatment. Cardea SOLO™ empowers physicians with more control through full access to timely, definitive data, supporting increased patient satisfaction, simplified global billing, and office efficiencies that offer economic benefits for your practice. A more timely diagnosis of arrhythmia is critical in your ability to make accurate decisions that can accelerate patient care. Cardea SOLO™ provides a point-of-care solution for effective and efficient diagnosis. Cardea SOLO™’s simplified arrhythmia detection system heightens patient satisfaction, which can boost compliance and ultimately augment the efficacy of diagnosis. Direct diagnostic management right from your office avoids incomplete testing as patients no longer need to navigate multiple clinician referrals. 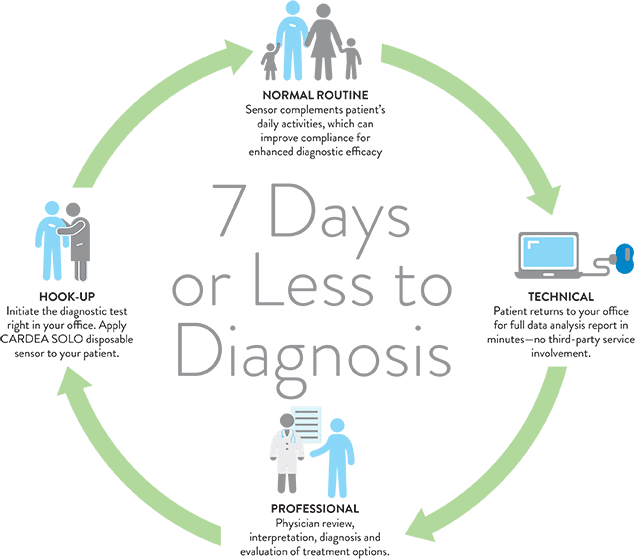 Up to 7-days of monitoring improves the diagnostic yield, with actionable diagnostic reporting generated in minutes, giving physicians total control. An Event Button and integrated Patient Diary augment diagnostic evaluation of symptomatic events. The point-of-care diagnostic process for Cardea SOLO™ eliminates the need for third-party services in favor of a streamlined diagnostic approach and simplified global billing. The Cardea SOLO™ system of care minimizes workflow burdens. No enrollment is necessary to start. The disposable, single-use sensor eliminates the need to manage equipment inventory and maintenance between patient uses. No investment in Capital equipment required. Cardea SOLO™ can also be used for post-procedural observation, ongoing evaluation of therapeutic treatment and care plan.